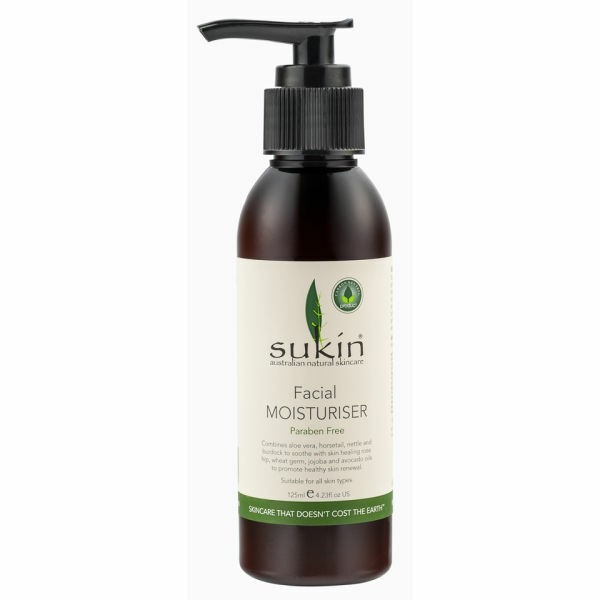 Pamper your skin every day with the Sukin Facial Moisturiser (125ml). Fast absorbing and deeply penetrating, this product provides excellent hydration as well as a soothing effect. The lightweight formula contains many active natural ingredients, including aloe vera, nettle and sesame and jojoba oils to promote a healthy looking glow and silky smooth skin. For the best results, use after cleaning and toning. Pump out a little of the product onto your finger tips and rub into your face and neck gently. This moisturiser is perfect for use on all skin types and does not contain parabens. By far one of the best skin care products I've used. Doesn't feel sticky, absorbs easily. Fantastic for my combination and very sensitive skin. I prefer this one to the Sukin Sensitive Facial Moisturiser. Give it a go! Fantastic price as well. I have been using the Sukin Facial moisturiser for a good few months now (on on my 3rd pot) and find it has really looked after my oily/combination skin. Used after Murad citrus face wash, it leaves my skin hydrated but not greasy. The rose smell is light and refreshing. It also contains jojoba oil that is great for facial hair, so it can be put on under/ through your beard and it stops any dry skin that could be lurking. Absolute bargain, and even better when they do the 3 for 2 offer.